These brothers, Demon (top left) and Zeus (lower right) are a bonded pair who’ve been together since birth. 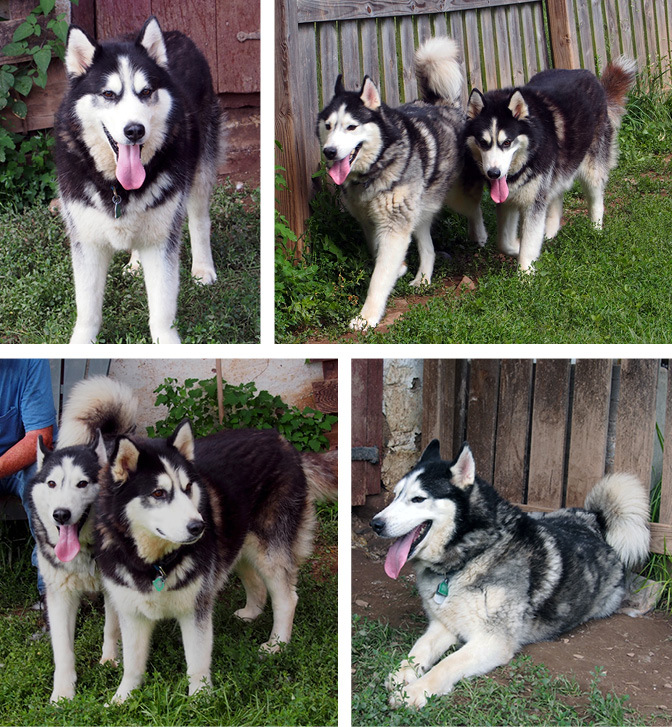 They’re looking for a forever home together with husky savvy humans. These guys ended up in rescue because life got too busy for their previous human to give them the time and exercise they deserve. Zeus and Demon are very friendly and lovable. They know their basic commands and walk well when on leash. True to breed, Zeus and Demon are happiest when they are with their humans, have a strong prey drive with small animals, love digging, and are seasoned escape artists. Their forever home needs to be appropriately fenced to keep them safely at home. They love riding in the car and are always ready to go on an adventure with you. These boys are absolutely wonderful dogs, so if looking for double the husky fun, then brothers Demon and Zeus could be perfect for you! Do you have questions about Zeus and Demon? Send an email.